We are taking advantage of the gorgeous weather this weekend and have headed out with the trailer for 3 or 4 days of rest and relaxation. 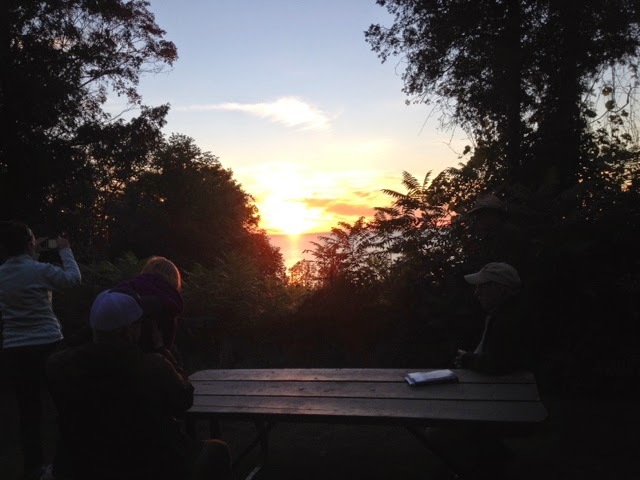 There was a lovely sunset over the lake tonight, although my iPhone doesn't even begin to capture it. This is Charlene's Grandmother's Flower Garden Quilt. I had never done one of these before, and I must confess to be very nervous about doing it. Charlene is always very trusting about what I do to her quilts. For this one, she said "do something to keep the feel of the time period of the pattern and fabrics", or something to that effect. Of course, my first thought was feathers.... I love doing feathers, and they seem to fit in most quilts, and most time periods. I had just received a new ruler in the weeks before doing this, for doing gently curved arcs on the long arm, and I thought this would be a good time to try it out. It's actually a curved cross hatching ruler, but I didn't think curved cross hatching would fit here, but piano key quilting would. And then feathers got added to the border, using the curve as their spine. Feathers in the flowers seemed a good idea, but what to do with the pathways....... continuous curves to tie it all together. I am so very happy with the way this turned out, after all the nervousness about starting it. Binding, tons and tons of binding, or rather, yards and yards of binding, is being attached to this quilt today. This is a picture of my quilt as it builds up on the wall behind my sewing machine. I have the binding already attached to the wrong side of the quilt. Then, I had to turn the whole thing around and start stitching in the ditch between the striped binding fabric and the light grey faux piping fabric. I managed to get almost 2 sides stitched to the front, but then decided it was time to give my neck and shoulders a break and get some supper. I'm hoping to get this done tonight, at which point I can add another finish to my list. Woohoo!! Once it's done, I'll get it spread out somewhere and get a picture of the whole thing. I'm going to link up to The Needle and Thread Network, relax for a few minutes with my coffee and the posts for today. Then it's back to the binding. This is Gail's Scrappy Mountains, a Bonnie Hunter free pattern. It's one that is most certainly on my seemingly never ending want-to-do list. 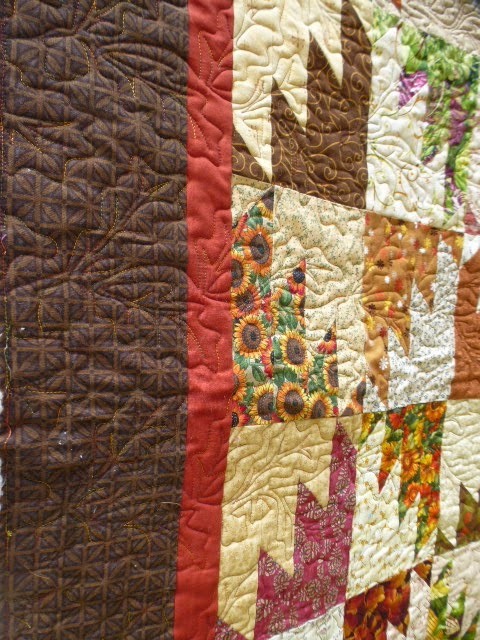 The picture here of the whole quilt does not really do the richness of the colours full justice. I've spread my current project out on the lawn, so I can get a good picture of it, spread right out, in good light. Currently, it is measuring 71 inches square, ot at least it will once I get the blue border on the other two sides. I am really enjoying the churn dashes and friendship stars that show up here. I am thinking of using up some of my abundant 2 inch strips, and making a wide piano key border. I want this one to be fairly large, to cover us up during those crisp outdoors nights. I think I am going to name this quilt "Camp Out", for fairly obvious reasons. There are tents and trailers and campers on the blue fabric in the top. And then, I have this marvelously soft and cozy and warm flannel, covered in trailers, for the back. 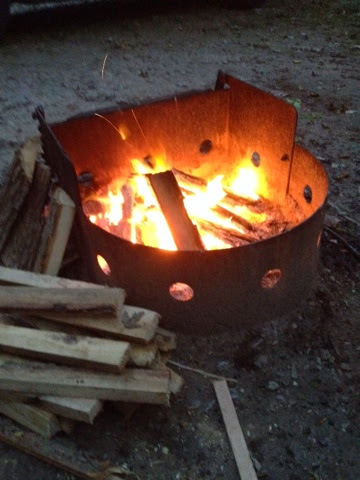 I'm going to use a thicker batt than usual when quilting it, and it will be perfect to take camping with us next year. If I'm not back into positive numbers, I should be awfully close. I did a lot of cutting and piecing on a UFO that ate up some stash, and I also made another quilt back, for another UFO. Slowly, they are getting done. However, if I do end up back in positives, it won't last long, because I ordered in some more diagonal striped fabrics for bindings, since I love the look of them, so much. Oh well, still not back to net used numbers, but since I only do this out of curiosity, I'm not stressing about it too much. I haven't set goals to use so much or only buy so much, I just find it fun to see how much comes in and goes out over the coarse of a year. I do know I've bought a lot less this year than other years, but that's mostly due to a decrease in cash available to spend on fabric, and some of what I would have used for fabric in other years, has gone on some of that lovely wool I've been knitting with this year. called Summer Rental, a pattern by Miss Rosie's Quilt co. It's been hanging in my studio since Nov. 2011, according to past blog posts. It is totally different than a lot of quilts I've done lately, so I thought I'd load it and see if I can get it done in time for the quilt show. Tomorrow should finish it. I've decided that this afternoon is a play afternoon. I'm going to work on the Nine Patch Churn Dash and see if I can't get it all put together. This is Maria's Baby Bunny quilt. The fabrics in this one were so very very soft, a lovely high quality flannel cotton. I had a lot of fun on this little quilt doing different stuff in the borders. Maria wanted the Animal Crackers pantograph in the centre of the quilt, and hearts in the borders, and I was very happy to oblige. The reversing hearts motif in the gold and blue borders is the same as the motif in the bunny fabric border, just re sized. It's one of my favourite border designs to do. It's quite versatile. It will be a very blessed baby that gets to be wrapped up in this lovely softness. I'm continuing to work on my On the Grass sweater. I have come to a realization, after picking up the stitches around the second arm hole....... I don't like doing sleeves like this..... picking up the stitches and the doing short rows to form the top part of the sleeve. This is the second sweater I've done with this technique, and I really don't like it. I'm going to have to start looking for patterns that don't have this type of sleeve, or, I'll have to totally love everything else about the sweater before doing it again. Anyway, having said that, I love the rest of this sweater, the wool, the colour and the double seed stitch texture. Better yet, it's almost done. This is Micki's baby I Spy quilt, which has to be really far up there on the cutest thing ever list. The bright, fun fabrics are fabulous. And I love the wide open white spaces as well. It's such a quick and simple design that is so very effective. I quilted it using the Animal Crackers pantograph, which fit in so well with all the fun fabrics. I've made quite a bit of progress on both of the projects I'm currently working on. I made four more of the underground railway blocks, to give me nine now. I think I'm aiming for sixteen, which will give me a square quilt measuring 65 inches, before borders, and will use up 80 of the nine patches. I'm thinking I could do something with the rest of the nine patches for the borders, maybe off set two rows of nine patches to form a checkerboard on the top and bottom and then a single row down the sides so that it's rectangular, rather than square, although I don't mind square quilts. I'll have to let this simmer for a little while yet. I'm working on this one down in the apartment, since it doesn't need a design wall. I'm working on the Blooming Nine Patch in the upstairs studio, since it needs to stay up on the wall This way I can take the pieces off the wall and sew them in the right order. If I were to bring it downstairs, there isn't anywhere to lay it out, and there would be a huge risk that I'd get the pieces out of order. When I first started adding in those black squares, the first reaction was that I didn't like it. But the more of them I put up, the more I began to really like the effect. It turned it from a little girl's pastel quilt, into a more mature look. I'm linking up to WIP Wednesday at The Needles and Thread Network, a link up for Canadian bloggers, and also at Freshly Pieced. Then it's time for supper, and some more underground railway blocks. I wonder if I can get the last seven done tonight? these flowers in the studio. over floral motif, with leaves and swirls thrown in. It was so much fun to do. I'm continuing on my quest to finish UFO's this year. A couple of years ago, our guild did a nine patch swap, and a mystery quilt using the nine patches. I didn't make the mystery quilt, because I already had one made from that design........ I was the designer, which was very exciting, and also very scary!! So, I have quite a few nine patches to use up. On Saturday, during the fun times at Gail's, I started making up some Underground Railway blocks. The eventual plan is to put it together similar to this quilt here. These blocks are pretty big, finishing at 13 1/2 inches. I'm not exactly sure just yet, how many of these blocks I'll be making, but I do know it won't come even close to using up this large bag of nine patches I have sitting here. I'm linking up to Judy's Design Wall Monday. There is a really great The Nature of Things program on right now, all about Canada's wild spaces and wildlife. So, after linking up, I'm going to set up my machine, sew some more railroad blocks, and watch this fascinating program. What a whirlwind, busy couple of days this has been. Yesterday was spent over at Gail's for a sewing day. Kathy and her friend Barb were there, as was Christine. I was a very bad blogger, and took no pictures, at all. But both Kathy and Gail did, so if you visit their pages, you can see some of what we got up to. There was lots of chatter and fun and laughter. And we actually all got a lot of sewing stuff done too. The day started at about 11:30 and ended at about 8:30 with a trip for some stash enhancement. It should be noted that Gail, who was the one who suggested the stash enhancement trip, and actually accompanied us there, bought nothing. I, on the other hand, stacked up on some backgrounds and some greens, both of which are getting to be in short supply around here, and a very pretty pastel that might work as a backing for something. It was such a great time. I'm so glad to have gotten to know such a great bunch of friends, and am no longer a solitary quilter. Today has been spent in the kitchens, yes that is a plural on the kitchens, making salsa. I started at 12:15 this afternoon, blanching and peeling half a bushel of tomatoes. That was done by 2pm. Then came all the cutting and chopping, assisted, quite ably, by Matt and Becca. We got to this stage by 4:30. Three large pots cooking down. And now, as of 8:45, there are 7 jars out of the water bath canner, 7 more ready to come out in just a minute, and another 12, maybe, yet to be done. It is a whopping amount of work, but it went much faster and much more enjoyably with two young sets of hands helping. I was going to take some pictures of my new stash additions, but I haven't had the time today. So, I'll just go on to the stash numbers. Considering the amount that came in this past week, it isn't that bad. Between the 2 quilts that got bindings, cutting for the Blooming Nine Patch and cutting for working on another UFO, the used numbers added up rather quickly. I'm linking up to Judy's Stash Report. Maybe After that, I'll find my knitting as I wait for the water bath canner count down. Wow, what is my world coming to? Two posts in one day, and I think maybe a post every day for the past week or so........ not bad, not bad at all. The weather finally cleared up enough for me to be able to get outside and get some pictures. I have been working on this quilt for so long, since May of 2013, according to past records here on the blog, that it feels rather strange to be no longer working on it. Her she is, in all her glory...... announcing....... Meteor Shower!!! Here's a closer look at all the fun colours in the center of the quilt. I had so much fun playing with all of these bright colours. It's such a sunny happy quilt. Every time I look at it, I smile. As stated many time before, the credit for the design of this quilt goes to Judy Martin. The pattern for this is found in her book Scraps. I think the instant love I felt for this quilt was in large part due to the colours, so I followed the colours she used fairly closely. Here's one of the corners. The quilting design shows up really well in this shot. I used a very simple, open and flowing star in star pantograph. I didn't want any competition between the quilting and the piecing. And lastly, a close up of one of the corners, showing my favourite diagonally striped faux piped totally machine sewn binding. I'm running low on those diagonal stripes. It might be getting to be time to do some shopping for some more. I'm continuing to work on my On the Grass sweater. 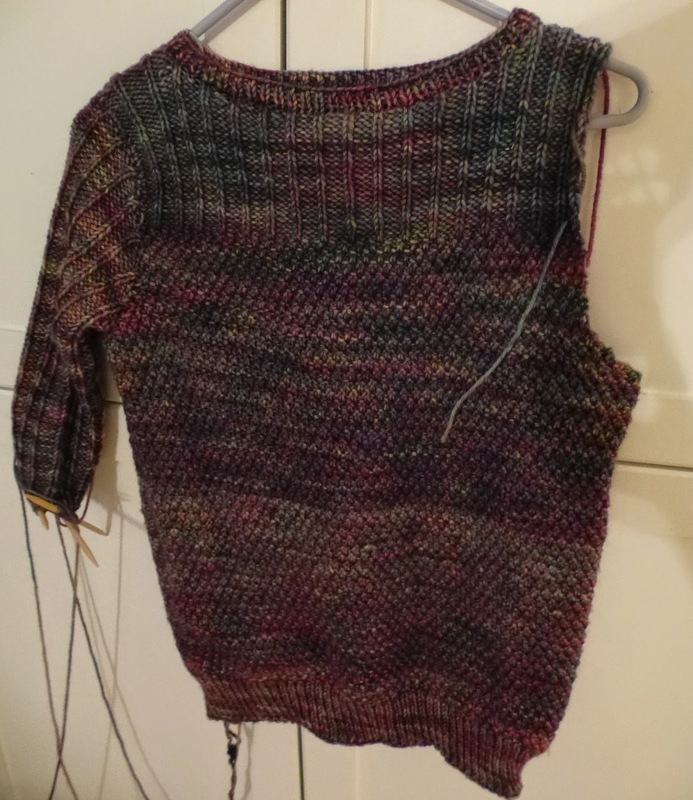 I'm almost finished the decreases on the one sleeve, and getting closer to doing the wrist ribbing. After that, do the other sleeve, sew in the ends and it's done. I did the neckline before I started the sleeves, since it was easier to do it without the added bulk that the sleeves would have added. I am loving this sweater, and the yarn, and the randomness of the colours in the yarn. I'm pretty sure I'm going to have some left over, so there might be a hat or two, and a scarf and mitts out of this stuff. They would be so delicious and warm for the fall and winter that is coming at us way too fast. This is Kathy's version of Bonnie Hunter's Celtic Solstice. Kathy is calling hers Angel Solstice, based on the fabrics she chose. There are angels and stars in the fabrics she used, although they don't show up very well in the pictures of the top I have here. I love the colours in this one, the pinks and brown and beige and gold. It's a very grown up but still girly colour combination. I really like quilt pattern designs that make the straight edges of the piecing look like curves. Here's a close up of some of the fabrics, and also the quilting. To go with the angel themed fabrics, Kathy chose an angel pantograph for the quilting design. It is very soft and flowing and curvy, and enhances the piecing so very well. There was a panel that went with the fabric collection, and Kathy pieced it into the backing. The angel quilting is easier to see on the solid fabrics here on the back. I've been doing binding. Other than getting a hanging sleeve sewn on, Meteor Shower is done!! It's pouring down rain outside today, so I can't get a picture of the whole thing, but here's a tease. The bottom corner showing the diagonal striped binding, with a narrow orange faux piping. Completely done by machine. I can't imagine the time it would have taken to do this one by hand, considering the quilt measures somewhere around 100 inches square. I'm still working on the Blooming Nine Patch. I'm starting to sew the diagonal rows together, even though I don't have all the nine patches done. I can always add them to either end of the rows once I get that far. I'm running out of room on the wall, and sewing them together makes the rows shrink quite a bit, giving more room on the wall. I'm going to make more nine patches tonight, after linking up to The Needle and Thread Network. The date on these pictures is April 1st. I thought it had to be around there, because it was nice enough to be able to take the pictures outside. It is very strange to think that it is possible I'll be back to taking pictures draped over the long arm because of bad weather, before I get caught up with these. There was snow out west in Calgary and Edmonton Alberta!! There are pictures of snow men!! What a terrible horrid thought!! This quilt of Pat's brings thoughts of spring and summer now, just like it did when she brought it to me back in March. It was quilted using the pantograph Plummage. I love the way the feathers show up in the pink fabrics on the corners. 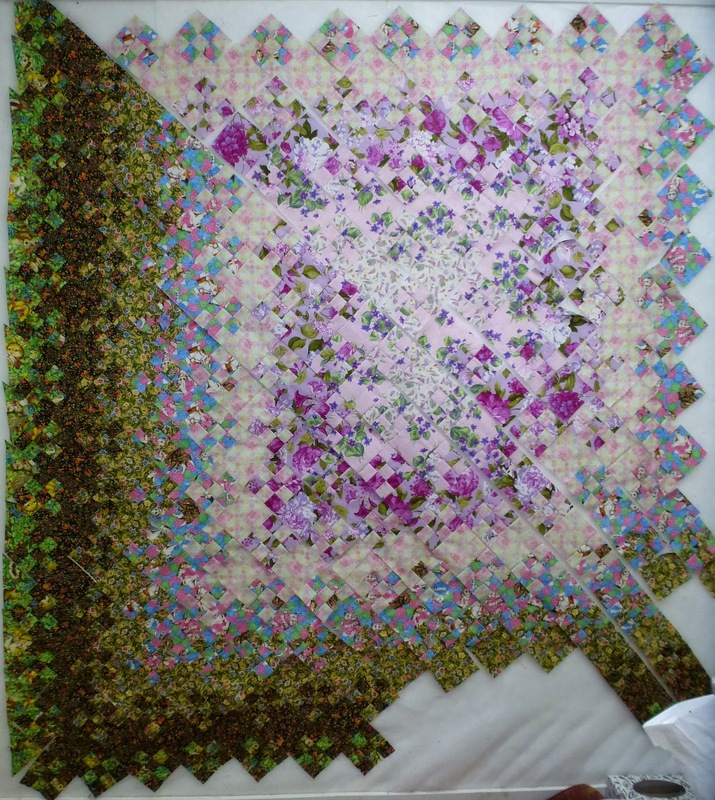 I don't know if I ever will make a quilt of my own using Kaffe Fassett fabrics. But it sure is fun to be able to play with his fabrics in other people's quilts. A couple of weeks ago I received an email from Kathy, of Kathy's Quilts, asking if I'd be interested in participating in this blog hop. No one seems to know where or when it started, but it sure has been fun reading the posts of those who have already participated. Kathy's post is here. It's a really fun way to get to see how various quilters' minds and creative methods work. So today is my turn to talk about the four questions that are the foundation of this blog hop. What am I working on? I never work on just one thing at a time. I tend not to do small or easy projects, so I often need to take a break from one project and work on another to keep things fresh and keep from getting bored, or burnt out on just one project. Doesn't that sound so reasonable and rational? The truth is closer to a bad case of quilters A.D.D. along with a quilter's disease called start-itis. Both are under control at the moment, but can flare up again without much provocation. I have more UFO's than I care to count, stored in a dark place under the stairs. I tried to get a picture of it, but it's way too dark and scary for publication. Some of those UFO's are listed on my right hand side bar, and it is encouraging to see that I've finished the piecing on five out of ten of them. My most current project that I'm working on is a Blooming Nine Patch, inspired by Teresa's quilt here. Our fabric choices are quite different, but I love the way this one is developing. I'm also working on a + & x blocks project, although I must say it has been ageing in its box for the past couple of months. I just got it out again to take a picture of it. I think it might be getting close to being worked on again. Come to think about it, it was Teresa again and her Happy Dance squares that got me started on this one. I decided though, that I was going to use fabrics in this project that are completely out of my normal style and colours range. A few months ago Gail, who blogs at The Cozy Quilter, went for a trip up to the Ottawa area, where the shop Mad about Patchwork is located. I gave her a budget, and asked her to pick out fabrics for me that were "outside of my box" Those fabrics, along with a selection of blacks and whites, are what this quilt will be made out of, and it just got named....... "Outside my Box". It's bright and wild, and quite outside of my comfort zone, and also quite a bit of fun. I have a quilt on my machine which is one of my UFO's. This is Meteor Shower a design by Judy Martin. 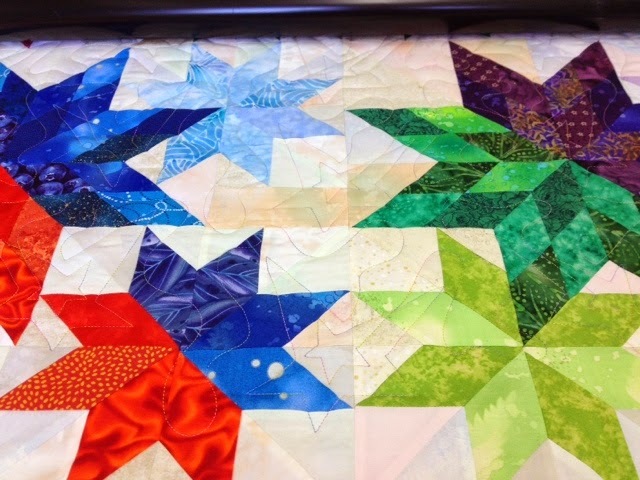 It's getting very simple all over quilting so that the colours and the designs of the stars will be the star attraction. (Sorry about the pun, I couldn't resist.) And the last current project, which is defined by being worked on in the last 3 or 4 months, is a McKenna Ryan design. This is just the beginning of a much bigger project called True Nature using fusible web applique. Question number two..... how does my work differ from others of its genre? I'm not sure that I do differ much from others. I like a wide range of quilting techniques, from regular piecing, to hand applique, to hand piecing...... 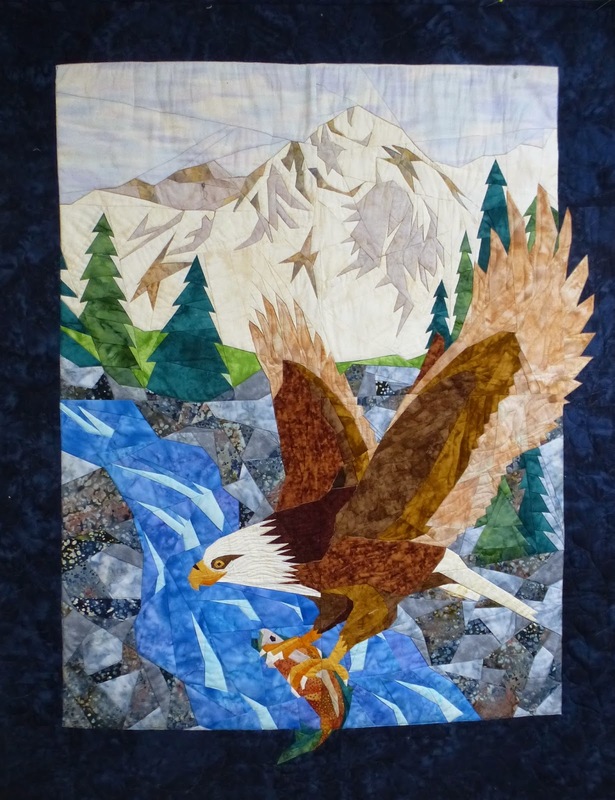 I'm itching to start an English Paper piecing project...... Then there is the fusible applique stuff like the mountain scene above, with all its tiny pieces that add the details. I have a love/hate relationship with paper piecing, loving the fantastic points and detail it provides, hating the actual paper removing process. Cynthia England's stuff is fabulous. I have a couple of her patterns, and even a kit for a waterfall scene that is on my to-do list. When I first started up my long arm quilting business, I decided on the name Eagles' Wings Quilts, based on one of my most favourite scripture verses, found on the header of my blog. Around that same time, about 9 or 10 years ago now, I saw this wall hanging in a magazine that specialised in paper piecing. Unfortunately, I didn't keep the magazine, and it has since gone out of publication, so I can't give a source for this pattern. Anyway, the whole point of this story was to show an example of some of the paper piecing I have done. This is a close up of the eye and beak. For a long time, this hung in my studio above my long arm. I have a new studio now, and haven't gotten around to getting anything hung there yet, other than one of my husband's paintings. I suppose one way my work does differ from others is that I do have the wonderful opportunity to have my own long arm machine, so that gives me much more flexibility in the ways I can finish the quilts that I make, rather than having to quilt by hand or on my domestic machine, both of which I did before investing in the Millenium. And, of course, I love being able to quilt for others, as well. All right, now to question number three........ Why do I write and create the way I do? I first started writing this blog back in January of 2010. It's original purpose was to be first and foremost, a way of keeping a very dear friend of mine, Susan, who lives in Alberta, in touch with what I was up to. We were doing email and facebook, but she would often ask me about what I was doing, or what I was working on, and there wasn't really any way in those two formats that would work to show her what I was up to. I had, at the time, no real idea of how blogging worked, or how extensive the blogging world was. I'm not sure I even realised how public it was. So, when I'm writing, I'm not really writing, so much as talking, in my head and through my fingers, to a very dear friend. And over the years, through this blog, and more recently through the guild, I have met some other wonderful friends. So, now I not only talk to Susan, but lots of other good friends as well. I've been told that my writing on the blog sounds very much like me, which I guess is a good thing. As for why I create...... because I have to, it's part of who I am and what I do. I have no talent for painting or drawing, so instead, my paints are the fabrics I use, to create quilts, rather than paintings or drawings. I'm not sure if I would qualify myself as a traditional quilter but I'm certainly not a modern one. I tend to mostly use designs and patterns that other people have done. Anyone who has read my blog for long knows that I am a huge Judy Martin fan. My inspiration usually comes from books or patterns I have seen, or projects I have run across during blog hopping. I have done some designing, but most of it has been in the Electric Quilt software program. I'm currently taking baby steps into writing patterns. I did one for our guild as a mystery a couple of years ago, and last year I wrote up the instructions for the London Roads block that our guild has since put together into a quilt and is using as a fund raiser. I am hoping to get some fabric requirements and instructions for setting this quilt together written up. The pattern should be available for purchase at the quilt show in October, with the proceeds going to the guild. I also put together, using the ideas from the program committee, this year's mystery row by row quilt for the guild, again using Electric Quilt, and I'll be writing up some of the instructions for it, along with a couple of other ladies on the program committee. Jacqui blogs at Treadle Quilts. I met her through joining The London Friendship Quilters Guild. She makes beautiful quilts on her treadle machine, and quilts most of them herself. She and her husband also find and restore antique sewing machines. She has a lovely studio in the lower level of their home where she also teaches quilting, and thus spreads the addiction. Debbie blogs at And Sew Forth. She makes stunning quilts out of some of the most beautiful and unusual batiks I have ever seen. She is a self admitted Bucilla Christmas stocking addict. Maybe she'll post a picture or two of her collection of stockings if we ask nicely enough. But even more interesting than that is where she lives. In the summer she hangs out in their home in the wilds of Alaska where it is nothing unusual to have a moose or a bear come pay a visit in their yard. During the winter, she lives in their apartment in the city of Paris, France. Thanks so much for visiting. Since it's also Design Wall Monday, and I have pictures of what's currently on my wall, I'm going to link this up with Patchwork Times. This has been a wonderfully productive week in the using of stash. Of course, it always helps when part of the stash used is for backings. And when that backing is for a quilt that is 101"x101", well, the numbers for that backing are awesome...... seven yards for that alone. And, because that project was finished, I was able to work on other projects that didn't have the stash already reported as used. Add to that, making a binding, and we are just so impressed.... or at least I am. I'd better make sure I keep this up, though. There is more being added to the stash this week, since an order from Mad About Patchwork will be coming in this week, something around 9 yards, I think. There was some really cool, well actually it will be really warm, camper fabric in flannel that will be perfect for a quilt I am planning which also has camper fabric in it. It would be fun to have it done for next year's camping season. Maybe I'll start on that once I have the Blooming Nine Patch finished. I'm trying really hard to finish something I start before starting something else. How long that will last will depend on how long it is before I get distracted by another project. My start-itis is currently under control, but not cured, but that's another subject altogether. However, I'm planning on making another backing this week, which should go a long way towards neutralizing those added numbers that are coming in, especially since the backing is for another large quilt. I've been asked to Participate in the Around the World Blog Hop, and my day for posting is tomorrow, so stop on by, if you get a chance. I think I'm going to take a good part of this afternoon, and at least get it planned out, and maybe started. In the meantime, I'm linking this up to Judy's Stash Report. I started the quilting on Meteor Shower today. 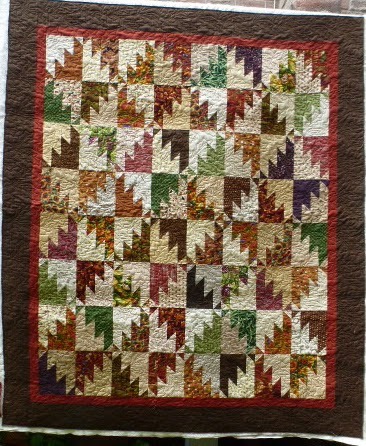 I decided that, since there is so much going on in this quilt, that I wanted the piecing and the colours to stand out. So I'm using a very simple and loosely open quilting design called Stars in Stars. It's going easily and fast, which is a wonderful added bonus. It's almost half done. Ok, this is my attempt number I don't know what, to get caught up on posting about customer quilts. I am going to try very hard to do two posts a week about them, on Tuesdays and Thursdays. Now that I've said it, maybe I'll be better about doing it. This is Christine's Lazy Sunday Mystery quilt. It was a design that was presented in four parts in the spring and summer of 2013 in Quiltmaker magazine. It's a Bonnie Hunter pattern. I think it's actually in her newest book, as well. This was such a fun quilt to do. The colours and the fabrics in this quilt are a riot. I'm not sure if you can see them in this picture, or not, but there are tea cups, high heels, bicycles, cherries, scissors and even some cows. And that's just what's in this small picture to the left here. There were lots more fun fabrics to be found in this quilt, it was like quilting a fun game of I Spy. It was quilted using the Plummage Pantograph. Since I finished up Meteor Shower the other day, I decided to give myself the treat of playing with this simple quilt that I started back at the beginning of August. It is quite easy to put together, exactly what I need after all the intense piecing of the last few quilts I've done. It's a Blooming Nine Patch. I saw Teresa working on hers here, and just had to start one of my own. The two won't look anything at all alike, which is one of the many wonderful things about quilting. The next round is going to involve some blues and pinks and some cute kittens. This quilt has decided that it wants to belong to a little girl, I think. Depending on how big it gets, I might donate it to our Children's Aid outreach project that the guild supports. I'm going to link this post up to the Canadian Needle and Thread Network for their work in progress Wednesday. Then, I think I'll find something to eat, and then play with the next set of four patches. This isn't my design wall. It's our design back yard lawn, the only place big enough with good enough light to be able to lay this out. It is currently 92 inches square. It has one more border to add. It will be one of the light blues in the quilt, and four inches wide. That is today's goal, to get that last border on. Then I can work on getting a backing done, and getting it quilted. I have been working on getting this UFO done for the last two or three months. I love this quilt, called Meteor Shower, from Judy Martin's book Scraps, but I am getting awfully tired of working on it. Our daughter, Becca, came out to see what I was taking pictures of, and it turns out she loves it too. So it might eventually end up living on their bed. 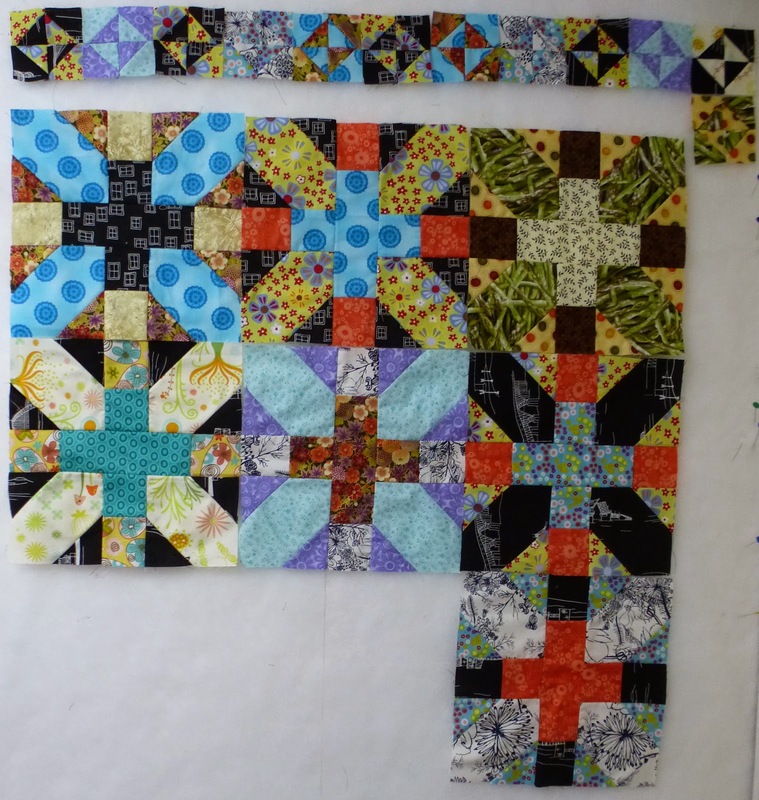 In the meantime, I'm going to link up to Patchwork Times Design Wall Monday, and then get those last borders sewn on.